The Brother ImageCenter ADS-1500W Desktop Scanner offers powerful features for your home office or small business in a sleek, compact design. 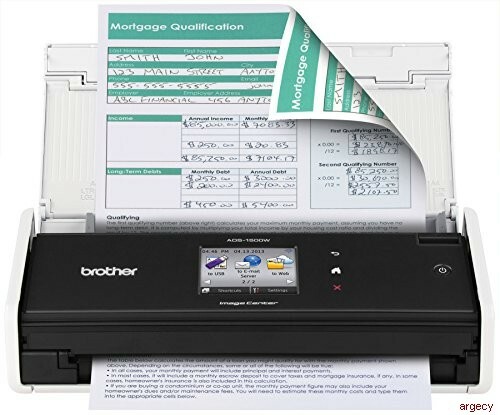 Using the 20-page capacity auto document feeder, this scanner is able to capture single and double-sided documents in a single pass at speeds of up to 18ppm, making it perfect for scanning multi-page, two-sided business documents, as well as single-page documents up to 34" long, receipts, business cards, photographs, and embossed plastic cards using the rear card slot. Wireless networking and Web Connect enable simple scanning to a wide variety of destinations including cloud applications- such as GOOGLE DOCS, EVERNOTE, Box, Picasa Web Album, FLICKR, Facebook, Microsoft OneDrive and OneNote, as well as mobile devices using the free iPrint&Scan app-, directly from the easy-to-use 2.7" color TouchScreen display. The included suite of scanning software, including receipt, desktop document and business card management programs as well as PDF conversion software, makes the ADS-1500W the complete scanning package for your small office. Direct-to-cloud scanning requires Internet connectivity and account with desired service; additional purchase may be required. Evernote is a trademark of Evernote Corporation and used under license. Requires connection to a wireless network. See www.brother.com for details, availability, and mobile device compatibility. The Brother iPrint&Scan free app download is not available in all countries. Requires Internet connectivity and account with desired service; additional purchase may be required. Evernote is a trademark of Evernote Corporation and used under license.